We have received your abstract for the NLUUG spring conference 2010. We would like to thank you for your submission and your patience. It is our pleasure to inform you that your abstract has been chosen by the program committee to be presented on May 6th. A little over a year ago I made a list of iPhone apps that I found particularly good, just to share the love. These applications are much better than most of the 140k apps available and, though all of them are paid-for apps, they are well worth getting! AirVideo, stream video from your Mac/PC to your iPhone/iPad. It supports -ALL-video formats, by performing live conversion, so you can watch -anything- on the go! Comics, buy and read comic books. Reading is made a very nice experience, because the app takes things one image at a time instead of dumping the whole page on screen. Dropbox, I've written about this before. It allows me access to my onion file storage, which is synced to all my Macs/PCs. I read comics with the above Comics, watch anime with AirVideo and I read manga and PDFs using Dropbox. What a team! 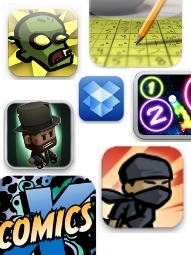 Zombieville USA and OMG Pirates!, both great side-scrolling fighters by MikaMobile. Zombies, ninjas and pirates, what else do you need?! Minigore, a frantic, top-down shooter. Easy to pick up, difficult to master. Orbital, a relaxing and great looking puzzler. Again, easy to play, yet very hard to master. Sudoku unlimited, for all I care the -best- sudoku app because of its "Newspaper" theme. Looks great, plays great. So, from the list it should be apparent that I play a lot of games on my iPhone. These games are great for a short pickup-and-play during small "cigarette breaks" at the office and during my daily commute. Mind you, now that Apple have introduced their new iPad I imagine some great productivity tools to come out as well!